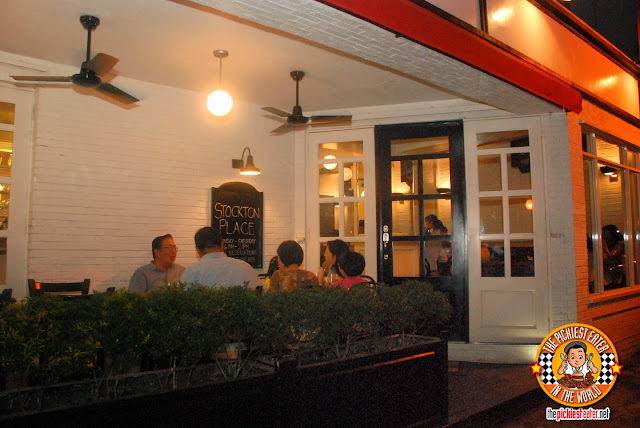 Stockton Place is a small restaurant in the heart of Legaspi Village in Makati, with white brick walls, wooden furniture, and black and white patterned floor tiles. At first sight you would think it’s a dainty coffee shop but don’t let looks deceive you. Its kitchen has got more than that! We tried only 3 dishes But mind you they were three mind-blowing dishes! We started with a refreshing salad But it’s not just any salad. It’s Foi Gras Salad (P450). 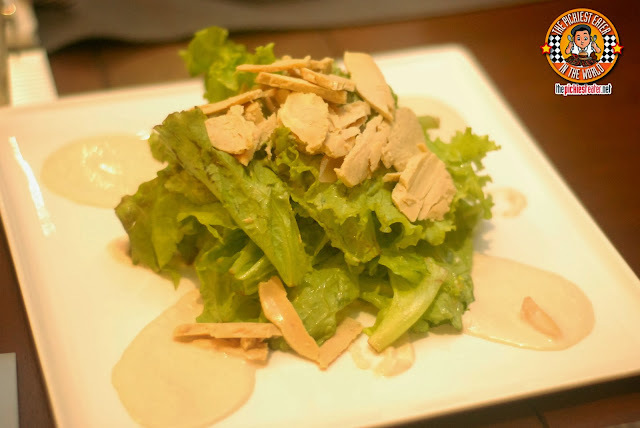 It’s fresh lettuce and other greens with some cocktail onions, dressed with peanut puree, and then topped with generous shavings of foi gras. It’s a beautiful mix of refreshing flavors in your mouth. Foi Gras lovers might not want to share this. 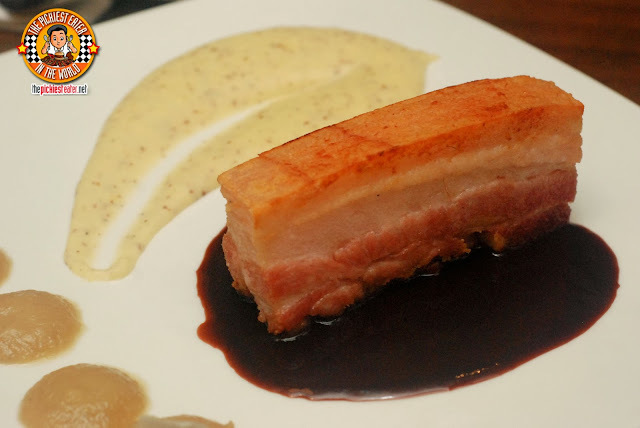 Richie also drooled over this Crispy Pork Belly (of course) through his computer screen. The marble of meat and fat is really tender and then the skin gives you that crunch that you’re looking for. The pork is placed in the middle of a puddle of cherry pork sauce. On the sides there are also squirts of onion puree to complete the whole flavor. Priced at P650. And last, but definitely not the least, is the USDA Prime Grade Ribeye! As I’ve said so before. This was definitely one of the best steaks I have tried in this lifetime. 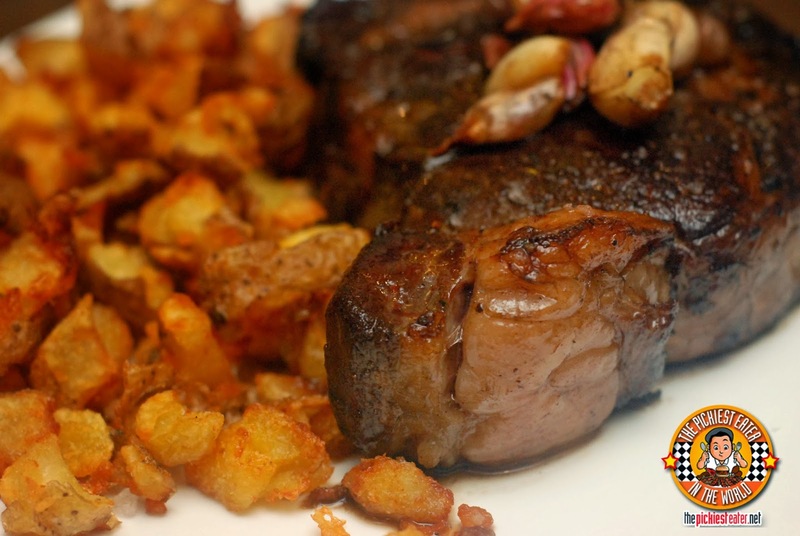 It’s perfectly seasoned and served with some Bordelaise sauce and these really addicting crispy potatoes. The potatoes were so good that this was one of the rare occurrence wherein I didn’t look for rice to go with the meat. 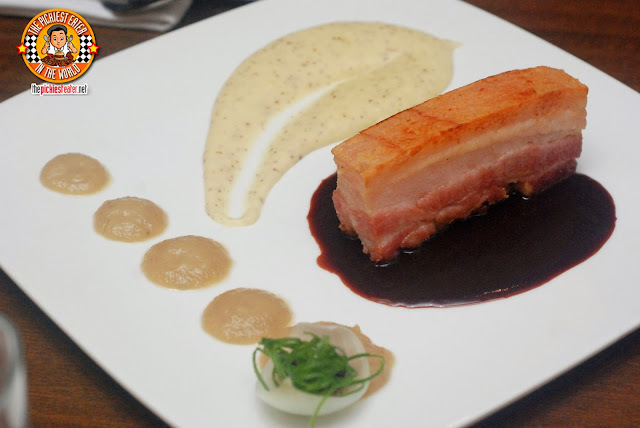 It is priced starting at P450 per 100 grams ( at 800 to 1200 grams per steak). Yes I find it pricey. But if you’re a hard-core ribeye / steak / meat lover, this is definitely something you need to put in your must-try list. 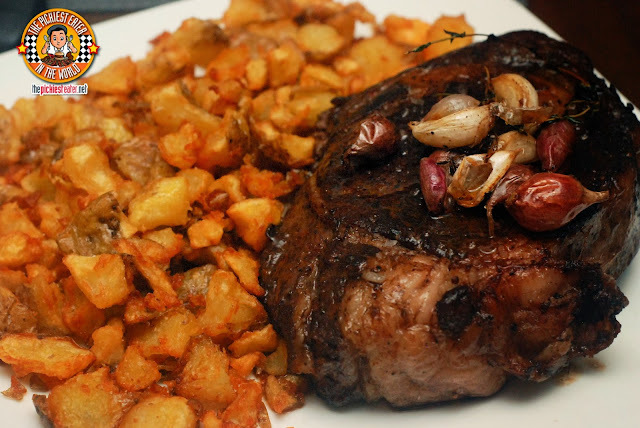 But not just the ribeye... all the dishes we got to try that night was outstanding! You really pay for the quality. Richie has been wanting to go back and actually asked if I can buy him the steak as a Christmas gift. Hehehe. No kidding! I'm freaking drooling right now, and I'm just looking at the photos! The ribeye looks glorious!